Spirit of Life UU offers many ongoing social activities, both fun and serious, designed to enhance spiritual and intellectual interaction among members, Friends and visitors, and to make a positive impact on our community. 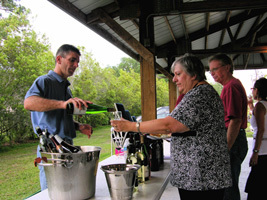 In addition to our Religious Education , Book Club and social action programs, we also host weekly Intermediate tai chi, monthly potlucks and circle suppers, periodic wine tastings and other community fun(d)raisers throughout the year. Calendar items must be submitted by the 20th of each month for inclusion in the church calendar. Announcements should be submitted by Wednesday if you wish information to be shared on Sunday. Please use the submission forms below for your church related contributions. For more information on any activity or program, or with any corrections, please get in touch via our Contact page. Read our Blog page, and check out our Calendar below for a look at upcoming programs and events.